"Created by Jerry Siegel and Joe Shuster in 1933, Superman was the world's first comic book super hero. His sensational powers and dynamic deeds changed forever the content and style of the comic book." 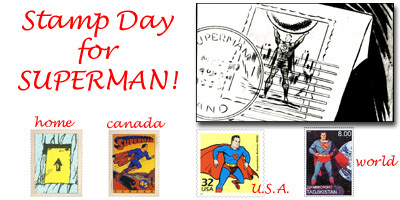 Superman, the legendary Man of Steel, began helping cards and letters speed to their destinations on September 10, when 15 new postage stamps honoring him and other icons of the 1930s were issued by the U.S. Postal Service in Cleveland, OH -- the metropolis where the super hero was "born." The Superman Arrives stamp and 14 other 1930s stamps are part of the Postal Service's landmark Celebrate The Century stamp and education program. They join three sheets of 15 stamps each (commemorating the 1900s, 1910s, and 1920s) now available at post offices nationwide. In cooperation with the U.S. Dept. of Education and 10 leading educational associations, the Postal Service has developed one of the largest-ever independent cross-curricular programs. The Celebrate The Century Education Series is expected to involve more than 300,000 classrooms of students, taking them on a field trip through the 20th century. "From the Great Depression and the New Deal programs to architectural marvels and heroes of fact and fiction, the 1930s stamps portray a time when Americans worked together to overcome great hardship in hopes of a better day," said Deputy Postmaster General Michael Coughlin, who dedicated the stamps at the foot of Cleveland's Terminal Tower Building at Tower City Center. When it opened in June 1930, the 52-story Terminal Tower was among the tallest buildings in the world and was the tallest building west of New York City for 40 years. "Stamps issued through the Celebrate The Century program chronicle American history in a new and exciting way," added Coughlin. Joining him at the ceremony were actors Jack Larsen, who played "Jimmy Olsen" in the 1950s The Adventures of Superman series; Tim Daly, voice of Superman in the animated TV series, Superman Adventures; and Dana Delany, voice of Lois Lane in the same series. Also on hand were Cleveland Mayor Michael White; David Sidoni, host of "Madlibs," a cable TV game show for kids; Don Peterson, Postal Service Cleveland District manager; and local postal employees and their children, who helped introduce each new 1930s stamp. Created by Cleveland natives Jerry Siegel and Joe Shuster, Superman first appeared in 1938. The Man of Steel was the world's first comic book super hero. His sensational powers and dynamic deeds changed forever the content and style of comic books. "Superman was born in Cleveland but he was Jerry Siegel and Joe Shuster's gift to the world," said Jenette Kahn, president and editor in chief, DC Comics. "In a time of privation, Superman shared everything he had to help others. In a time of shattered dreams, he taught us we could fly." "DC Comics is honored to have Superman take his place in a pantheon of such legendary heroes as Jesse Owens and Eleanor and Franklin D. Roosevelt," said Kahn. "As someone who truly understands the concept of Airmail, he can't wait to carry millions of letters to their destinations." The sheet of 1930s stamps was designed by Howard Paine of Delaplane, Va., and includes original illustrations by Paul Calle of Stamford, Conn., and reproductions of photographs, chromo-lithographs and other existing art. The Superman Arrives stamp design is a reproduction of art from the cover of DC Comics' SUPERMAN #2 (Fall 1939).